Want to hear a funny word? Unprecedented. Things are only ever unprecedented if one’s too lazy to look for precedent. To coin a phrase: There is nothing new under the sun. Oh, wait. But can we meaningfully measure the speed with which new ideas move to market? 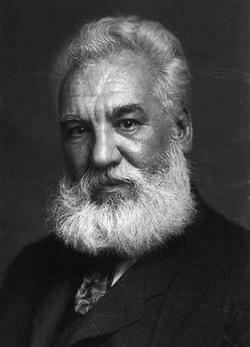 Alexander Graham Bell filed his patent for the telephone in February 1876. By April 1877, the first commercial telephone lines were being installed. Of course you can cherry-pick examples to show greater or slower speeds. Or you can misunderstand things entirely, as CNN does, conflating the number of transistors on a chip with innovation itself in a painful misapprehension of Moore’s Law. All this talk of an increased pace of innovation or technological change gets to me because it is used (by people like Swindle) to claim technology will eliminate the need to make hard choices. More generally, if change is faster now than ever before, it gives us license to dismiss the lessons of history as being inapplicable. To speak meaningfully of living in a period of abnormally fast change, we need to have some meaningful (if rough) measure of how quickly science is really moving. And I don’t think we do. These things are just incommensurate. How does the development of Facebook compare with that of the telephone? The Times article likens new iPhone models to new car models, which is comparing Apples with Camaros. The first trans-Atlantic telegraph was a sea change in a way that few later developments have been: All of the sudden, these lands that had been sundered by weeks could communicate near-instantaneously. Certainly people try to quantify technological change somehow. For instance, by counting the number of patents. But this is obviously a really bad metric—not every patent is of equal significance. In a January report, the Center for American Progress basically said, we know it’s a bad metric; we’re going to use it anyway. This seems silly to me. There are more complicated metrics of how “innovative” a country is, or of how fast it is innovating. But they’re all bad, I think, and they always will be, for the following reason. There are things that make sense to measure in the aggregate. Most obviously, there’s temperature. You’ve got the random motion of many millions of molecules, each with a position and velocity all its own, distilled to a single number. In certain contexts, this number tells you everything you need to know. Add just one more number—humidity—and you’re even better off. GDP is another number that is useful. Though it has its well-documented shortcomings, it effectively distills the “temperature” of the economy. What do these two things have in common? There are underlying, genuine quantitative data. Those molecular velocities and individual purchases and sales can be meaningfully aggregated. Now let’s think about measuring outcomes of scientific research. We have no comparable starting point. One dollar of economic activity is the same as another, while one patent is not the same as another. Nor is one academic paper the same as another. This discussion is important not just because it would be nice to know whether the speed of innovation is indeed increasing; the stakes there are mostly about rhetoric. Science bureaucrats are also well aware of the lack of data with which to evaluate research. That’s why they push for scientists to give them more information as part of the grant application process. But, as you’ve pointed out, Dan, this is of dubious benefit. You’ve written about the desire to better quantify outcomes stemming from scientific research, saying “modern societies have very little understanding of how to catalyze and steer these sorts of complex systems changes, and well-intentioned efforts can often lead to unanticipated consequences whose benefits are very difficult to assess.” On the surface this sounds like a good idea. But I wonder how this can be done without going down the path of granularity, of asking how bit of research A improves societal outcome B, a question we both think is silly. A lot of the discussion around “improving effectiveness” of scientific research circles around the idea that scientists want to be effective in advancing Vannevar Bush’s vaunted triumvirate of economic prosperity, better health, and national defense. But I think we’re underestimating the importance to the scientific endeavor of curiosity and camaraderie, both of which are awfully hard, if not impossible, to quantify. Scientists, like soldiers, seem to me to be motivated more by the internal logic of the task at hand than grander ideas of patriotism. I don’t know that there’s a lot to be gained by trying to systematize knowledge about what it means to feel “lucky to be in on it.” In your lovely essay “Against Holism,” you seem to agree with this skepticism, writing: “[D]eclaring that the science is separate from the politics is an arbitrary act of boundary-drawing.” How do you reconcile this with a program of advocating “outcomes-based science and innovation policies”?